These six moves will maximize your strength, build lean muscles and burn fat at minimum time. You need: bench or any other platform, free weights, mat, resistance band. Plyo Push-Ups is a great exercise to develop upper-body power. Start off in a push up position on the floor with your arms fully extended at shoulder width and keeping your body straight. Slowly descend to the ground by flexing through your elbows, lowering your chest towards the ground until you feel a tension in your chest. As soon as you feel a stretch in your muscle quickly push yourself back up so that your hands leave the ground. Dumbbell Step Up With Bicep Curl trains your core, glutes, triceps and chest. Place a box or bench in front of you and grab a dumbbell in each hand with a palms up grip. At the top of the step curl your arms up bringing your biceps towards your shoulders, squeezing the bicep muscles. Lying to Side Plank works your entire core. Dumbbell Lateral Lunge With Bicep Curl works your quadriceps and glutes. And the curl portion of the movement is good for your abs and biceps. Start off by grabbing a dumbbell in each hand with your palms facing up and standing up straight with your feet together, your back straight and your abs drawn in. Allow your arms to extend down fully in front of your thighs. As you go into the lunge curl your arms up towards your shoulders contracting your biceps, squeezing the muscle. Hold for a count and then return to starting position and switch legs. Sissy Squat improves balance and develops lower body muscles. Start off by standing up straight, with your feet shoulder width apart next to either a smith machine or support structure. Bend slightly with your knees, place one arm across your chest and use the other to hold onto the support. Slowly lower your body backward, while raising your heels off of the ground, squatting down until you feel a stretch in your hamstrings and hold for a count. Band Shoulder Press allows you to vary the resistance without having to use too much equipment. 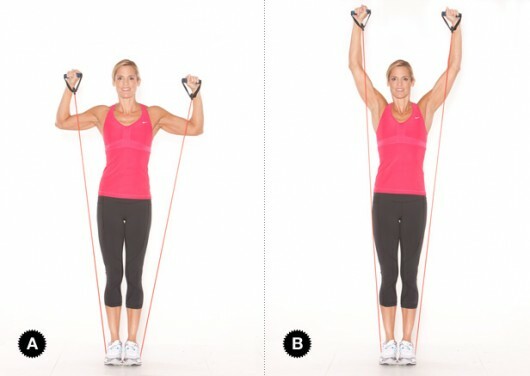 To begin this exercise; stand on a band so that it is evenly distributed to be pulled by each arm. Grab the handles and press your arms up so that they are at shoulder level. Then using your shoulders, raise the hands above your sides so that they are above your head then lower the handles back down to the starting position.